What differentiates us from the rest is we have the capacity to accommodate up to 200 guests for a wedding breakfast, or any other special celebrations and events that this beautiful barn can be utilised for. For a high resolution version of this plan please enter you email address to download. Perfect position for bands, groups, discos, grand pianos or anything else you may have in mind… The Granary is very well placed sitting centrally within the barn also being elevated overlooking the dance floor giving a real stage presence for any event, especially weddings. Stepped back from the main barn offering plenty of bar space, fully-equipped with ample fridges & shelving & optics to display. In a nice cosy seated area for some of your guests to relax in. Extensively equipped Caterers’ kitchen with two double falcon dominator ovens, two fan-assisted electric ovens, hot cupboards, heated serving area, stainless steel tabling & surfaces for prep work, double fryer and Falcon steakhouse grill. The Barn is set amidst rolling countryside on the Suffolk and Essex border. 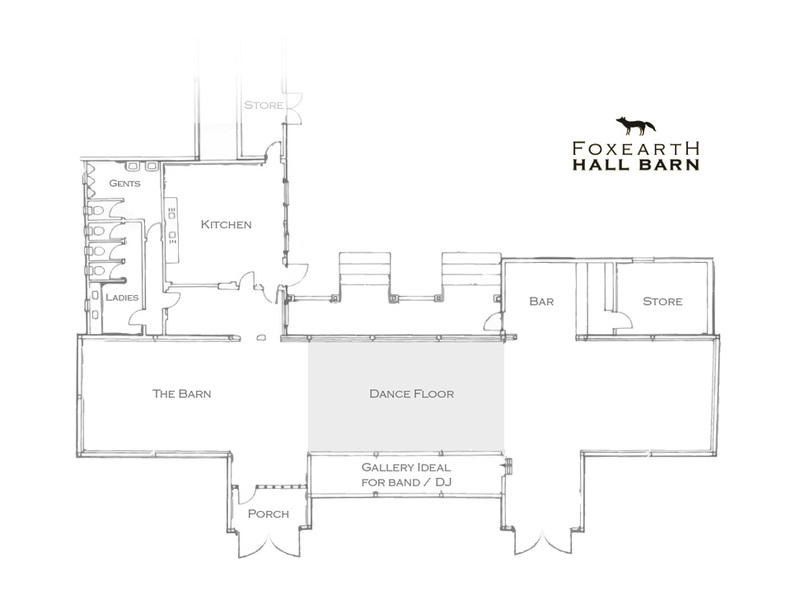 The Barn belongs to Foxearth Hall a charming farmhouse with the most amazing grounds including a moat which lends itself to some idyllic photoshoots. See more fantastic spots for photos in our gallery. Adjoining at the rear of the barn is a fantastic walled off courtyard creating a great outdoor entertaining space which could be utilised in many ways, whilst keeping little ones contained and safe. It also offers a large purpose built brick BBQ which lends itself nicely to outside dining if requested. See gallery for more photos.